Going from triple-distilled Irish whiskey to its mate a triple-distilled Scotch Whisky 150 miles away by air. I'm not the biggest fan of Auchentoshan's regular official range, yet I've always enjoyed independent releases of its whisky. 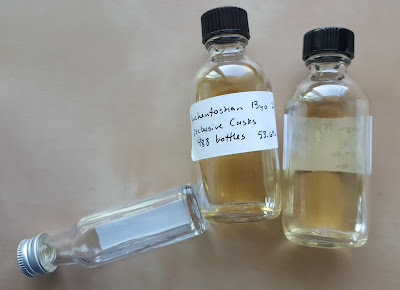 And I have to ask, am I the only one who finds every single indie Auchentoshan odd? Will this week's three bottlings continue the weird streak? First up is the youngest and strongest of the three, a 13 year old from The Creative Whisky Company's Exclusive Casks line. My last post about one of their whiskies caused some hubbub. Let's see if this one will do the same. I actually wrote about this whisky a year and a half ago while doing an eight-whisky tasting. The whisky was weird (as usual, as mentioned), but not my brand of weird. I was promptly told privately, by two people whose palates I respect, that I was out of my Vulcan mind. Try it again, they said, it must have been the sample! Okay then somebody give me a new sample, I said. Nothing. So I went out and got the sample myself, grabbing THE LAST bottle of it anywhere (according to Total Wine's website) for March's OCSC event. And, indeed, the whisky elicited some "That's interesting" comments from club members. I tried a half ounce and found it most......drinkable. Here's a review of a larger sample, nosed in the dark confines of my whisky cave. Its color is light yellow. Its nose begins with a pleasant mix of barley, lemon zest, and spearmint. And then a blast of white rye spirit slams through. Giving it a few minutes......now there's papaya and cloves. Black cherry soda. Big League Chew (bubblegum). Okay then. The palate is barley spirit-forward as well, though never too sweet. Some Ceylon cinnamon and clover honey. Suddenly it develops a rooty earthy note. Some mushrooms too. And here's the bubblegum. The finish gets sweeter than the palate. Some sugar in with the cinnamon. It's bold and fizzy. Fudgey at times. Rich and sticky. And the bubblegum. Oooh, the nose gets super fruity and totally nails the candy shop thing better than Glenmorangie Milsean (and without the wine cask futzing, mind you). Bubblegum, gummy bears, Big Red chewing gum. The palate remains rich at this strength. Big Red gum, honey, fresh ginger, and rock candy. Still has that slight earthy thing underneath. It finishes sticky sweet. Bubblegum, oranges, and a fragrant floral tea. It's a cracker. And damn it, Andy, I found the Big League Chew note too. It's the nose that wins here, with or without water. It's all a bit schizo, especially the neat palate, but it usually works. It may even work best *glup* with water, which pulls things together as best as possible. But trying to corralling its separate parts is like herding two-year olds, yet slightly less stressful. So what about that original mini-review? I caught all the candy and barley notes in both instances, but I didn't get the fetid cheesy notes this time, which definitely helped it out. Perhaps six months in a half empty sample bottle did the whisky no favors the first time. I still say this is some weird whisky, but this time I can see what the fuss was about. Um, Bushmills is also triple distilled. It even says so on the miniature's label. Yup. That's what I get for writing the intro paragraphs at 4am on my phone this morning. Originally had a whole thing about the Irish and the Lowlands. Two whiskies each. Then in the dark this morning I had a Eureka! moment. Double distillation! Two and Three! Wrong. Apologies. I'll still do a 3rd Auchentoshan maybe squeeze it between the 2 I'd planned.